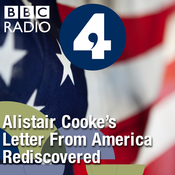 1970s America rediscovered through lost recordings of Letter from America, on the 10th anniversary of legendary journalist Alistair Cooke's death. Paddy O'Connell and guests including historian Dominic Sandbrook, Alvin Hall, Ann Treneman and Naomi Shragai will reflect on the personalities and stories of 70s America - from Nixon's resignation, Muhammad Ali to Vietnam and women's lib. The Letter from America programmes featured were taped by two listeners and stored in a cellar, an attic and a fertiliser spreader for nearly 40 years. They were recorded by a dairy farmer from the Cotswolds, and a man from Cornwall, who between them have provided the BBC with over 650 lost Letter from America programmes from the 1970s and 1980s. Music chosen: Alvin Hall - Stevie Wonder, Sir Duke Ann Treneman - Bob Dylan, Forever Young David Henderson - Don Mclean, Colour TV Blues Naomi Shragai - Bruce Springsteen, Born to Run. Presenter: Paddy O'Connell Producer: Zillah Watson. Give the Communist masses what they really want - a delivery of consumerism. This archive edition of Letter from America was recorded by one of two listeners, who between them taped and labelled over 650 Letter From America programmes from 1973 to 1989. It was restored by the BBC in 2014. Too strange to be believed, the natural phenomena that prompted the founding of the US national parks. This archive edition of Letter from America was recorded by one of two listeners, who between them taped and labelled over 650 Letter From America programmes from 1973 to 1989. It was restored by the BBC in 2014. Former White House aide Donald Regan makes public the First Lady's intrusion on policy and appointments. This archive edition of Letter from America was recorded by one of two listeners, who between them taped and labelled over 650 Letter From America programmes from 1973 to 1989. It was restored by the BBC in 2014. Enjoying a different pace of life at the Augusta National, a Georgia Shangri-La. 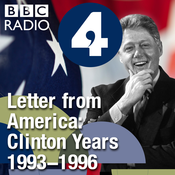 This archive edition of Letter from America was recorded by one of two listeners, who between them taped and labelled over 650 Letter From America programmes from 1973 to 1989. It was restored by the BBC in 2014.